I selected Time as the topic for this week’s post on The Pagan Experience as a way to explore what this word that carries so much weight for us as humans really means. It is interesting how, not only the meaning of the word changes, but also the weight of it changes as we grow older. As children, the concept of time means very little. We wake in the morning sure that everything we hope to accomplish in a given day will be achieved. We eat, play and socialize as though time has no control over how those precious minutes and hours are spent. We fall into bed exhausted from the day’s activities and sleep deeply through the night, never mindful that we have grown one day older and the brevity of our life in this form has been shortened by this singular day. As we become young adults, time is doled out in how much can we cram into a singular day that is not work or otherwise required activity. We burn the proverbial candle at both ends, extending the weekend play into a continued stream of friends, entertainment and hanging out. The adult years stretch into a never ending stream of work, family and other obligations that, now as responsible and productive adults we fill our time with. Time is creeping up on us and there is never enough in the coffers after all has been spent in meeting the demands of society’s clock. Now the focus becomes, “how much time is left?”. How long will I live and during that time and will there be adequate time for me to relax and enjoy a retired lifestyle? These and more deftly riddled questions of time fill our minds as we send even more of our time worrying and planning for a future where time momentarily remains still. And, finally, the blessed days of retirement are upon us. No longer held in the time piece that has driven much of our lives up to this point.We wake in the morning sure that everything we hope to accomplish in a given day will be achieved. We eat, play and socialize as though time has no control over how those precious minutes and hours are spent. We fall into bed earlier each evening exhausted from the day’s activities and sleep briefly through the night, ever mindful that we have grown one day older and the brevity of our life in this form has been shortened by this singular day. Now here is a spiritual reconciliation to what I wrote above. 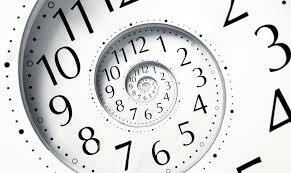 We are held to the mandates of linear time; the construction of the perceived ending and beginning of all facets of our lives that serves as the master clock maker of our live’s experience. We know this to be true and feel its edict at point if we choose to remain in the collective setting. Those few who live off the grid, self- sustaining in their lifestyles and held accountable only to themselves for their continued existence abide by the clock of nature. Their work is that of providing food during the seasons and times when food is most abundant. They build, shore-up for the Winter and plan for the Summer all in accord with a time maker that is celestial and cyclical in its ticking. Now, let’s take this though a bit deeper. Time exists simultaneously in overlapping waves of past, present and future. In the time that it takes you to read this sentence, the past is already gone (those first few words); the present is occurring in accord with where (the word) you currently are in the sentence and the future is the predicted response that occurs as opinion/reaction to is formed with each word read along the path of the sentence itself. Just breathe…. and re-read what I said again, because this may be a lot to wrap your head around. If we hold this thought/intention in mind as we move through our daily activities, there is actually a sense of freedom that becomes to occur and the spaciousness of sensing time as a longer stream of occurrence gives us the feeling of having more time available. Whether this by product of seemingly more time is the imaginings induced because we have finally relaxed into the constraints of time or is an in-measurable valid occurrence is really of no import. The real gift is that of being able to move in accord with linear time and the societal demands it imposes while remaining centered in the timelessness of knowing that time flows in rhythmical course that allows for stops along the way to regroup and rethink the direction that you are allowing yourself to be moved in. Just breathe into the spaciousness of time and you will understand that time is neither ally nor foe, it simply “is”, and our relationship with it leads to a life of feeling under pressure or one of savoring every moment as the soon to be past that informs my present so that I may step courageously into my future. to read articles or reviews, but this blog presents feature based content.